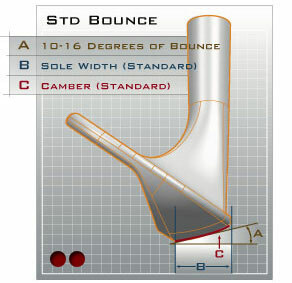 If I asked every golfer that walked through the shop if they knew what bounce was on a wedge, almost everyone would look at me strangely and say “NO”. Most golfers have no idea that this characteristic can have a massive impact on how the club performs during a shot and is often overlooked. In this short article I will explain to you what bounce does, and how getting the correct amount suited to your technique can help you in getting the ball closer to the hole. So what is the bounce on a wedge? 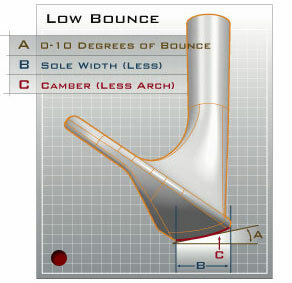 Bounce is how much lower the trailing edge of the sole is in relation to the leading edge. “Angle of attack” (the angle the club approaches the ball) is the first thing about your golf swing which should determine what type of bounce you want on your wedge. If you take divots with your short irons, you more than likely have a steep angle of attack and are referred to as a “Digger”. If you don’t take divots with your short irons, you more than likely have a shallow angle of attack and are referred to as a “Picker”. Once you have determined which classification you fall under, the rest is pretty straightforward. Diggers will benefit from a wedge with more bounce and wide sole, whereas pickers will benefit from a wedge with less bounce and narrow sole. If you are still unsure what classification you fall under, then there are more factors which can help you determine which is the right wedge to suit your needs. Course conditions are a factor which you need to also bear in mind. If you play a course where it is dry with a firm base, then less bounce and a narrow sole will benefit you. Whereas if you play on a course where it is particularly damp and wet with a spongy base, then higher bounce and a wider sole will benefit you. Hopefully, this information will help you to make a more educated decision when faced with lots of different wedge types to try and purchase. If you are still unsure please consult one of us here in the shop at Westridge.